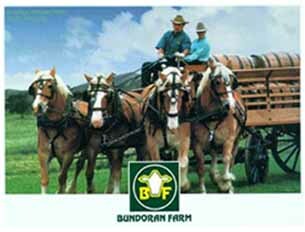 The four-horse Bundoran Belgians team, the four-horse Bowman Belgians, and the two-horse Faulconer Hardware teams are all the same horses. They operate under separate sponsorships for these historic-minded and successful modern enterprises. Our teams have traveled to Barboursville Vineyards with our massive water wagon in support of the Charlottesville Regional Chamber of Commerce, and have paraded three-abreast pulling the smoke-generating steam-powered fire pumper owned by the Charlottesville Volunteer Fire Company. Our big teams have supported White House Apple Products of Winchester, the University of Virginia's Firemen's Appreciation Day, traveled to Virginia Tech in Blacksburg for Animal Industry Day, and have appeared in many public parades throughout Virginia. We are familiar with the requirements of professional filmmakers, and our horse teams have worked with Bruce Weber as he photographed the Versus line for Gianni Versace. With our driving students, the Bundoran Belgian horse teams are comfortable working at home in our Driving School and have been featured on the Virginia Currents Public Television show. Really good horsemen will appreciate our light driving horses that we occasionally offer for sale. 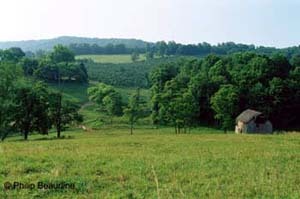 We maintain a small herd and a matched hitch of four heavy Belgian draft horses who live comfortable lives in these beautiful pastures. No question these teams can make an impression on your customers. Quiet, safe and friendly, both our horses and our professional teamsters and our farm crew really like people, and it shows.